Shenouda was viewed as a spiritual, social and sometimes political leader who guarded the rights of Egypt's minority Christian population. CAIRO — Tens of thousands of Egyptian Christians converged on a landmark cathedral here Sunday to bid farewell to Coptic Pope Shenouda III, a protector and father figure to an ancient minority now struggling for a place in the new, Islamist-dominated Egypt. Whether tearful or defiant, Copts said they worried that the loss of 88-year-old Shenouda, who died Saturday after a long illness, leaves space for extremists to widen a devastating sectarian campaign that's persisted for years but worsened since the revolt that unseated President Hosni Mubarak a year ago. Shenouda, who led the Coptic Orthodox Church for more than 40 years, was looked upon as a spiritual, social and sometimes political leader who guarded the rights of Egypt's minority Christian population in a region prone to religious animosities. The pope's death comes at an extremely sensitive time, as the ruling Mubarak-era generals and Islamist-led Parliament chart Egypt's future through a new constitution, revised legislation and presidential elections in May. Without Shenouda's influential voice, many Copts fear that they will lose a platform for their longstanding grievances, including bureaucratic obstacles to church-building, violent anti-Christian attacks and the exclusion of Copts from senior political or security posts. "Every Copt is asking the other, 'What are we going to do now? How are we going to survive? Are they going to cleanse us from this country because this wise man is no longer here?' " said Ihab Aziz, president of the Coptic American Friendship Association, who left his home in Washington and returned to Egypt a year ago to fight for the inclusion of Coptic rights in the revolutionary agenda. Copts, who make up about 10 percent of Egypt's population of around 82 million, have long complained of discrimination and oppression in a country where Sunni Muslims make up the absolute majority. 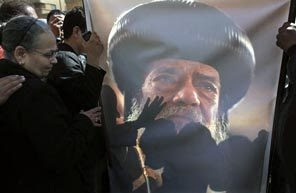 "I've always looked up to Pope Shenouda like my godfather. I could disagree with my biological father but not with the late pope," said Nabil Kamal, a 46-year-old engineer from Cairo. "His opinions about religion and various aspects of life were like sacred orders to me and many Copts. It was not just because he was our pope, but rather because he made sense and was convincing in pretty much everything he said or did." Dressed in black and carrying portraits of the late patriarch, mourners filled several city blocks around St. Mark's Cathedral in Cairo. Riot police formed human cordons to control the masses standing shoulder to shoulder at the entrance of the church, waiting to pay their final respects to the pope, whose body was seated inside on an ornate throne. Lamentations of "Oh, father! Oh, father!" rose from the crowd. Tragedy struck during the sorrowful day. Three mourners suffocated to death in the crowded church, said Church official Anba Younnes. Shenouda, seated on the throne of St. Mark, or Mar Morkos, was clad in the elaborate regalia he traditionally wore to oversee services. His head slightly tilting to the right, he held a scepter. He is to be buried Tuesday. Egyptian authorities announced a period of public mourning and were keen to show that the nation's military and Muslim leaders were in solidarity with Christians. The grief expressed in state-run and private media appeared to surpass the coverage given when Mohammed Sayed Tantawi, grand sheik of the Islamic world's top Sunni Muslim institution, Al Azhar, passed away in 2010. Church officials announced Sunday that Bishop Pachomious would take over the papal duties until a new pope is chosen in two months.